There's been big turnouts to events throughout the South to welcome in the New Year. In Queenstown, one of New Zealand's party capitals, thousands whooped and hollered as a spectacular fireworks display began 2019 on Queenstown Bay. About 3km of waterfront from Queenstown Gardens around past Steamer Wharf was packed with revellers of all ages seeing in the New Year. Many had danced the night away in front of two stages; a main stage on Earnslaw Park featuring bands, and a more lively dance stage outside Eichardt's Private Hotel's $10,000-a-night penthouse and hotel. Whoever paid the sum had one of the best views in the world for the start of 2019: a sea of people watching the fireworks shooting up from a barge in the bay. Others sat on Queenstown beach, where many boats had been pulled on to the sand. The resort's bars were packed - about 100,000 people visit Queenstown in the holidays and usually close to 15,000 make their way downtown for the big New Year countdown. Tom Willocks, of Balclutha, in town for the night with Richard Watt, Hannah Wilson and Lauren Gorinski, all of Dunedin, said: "The whole night has been electric." There did not appear to have been any major trouble in town before midnight, although there was an notable police presence. The party will go on long into the early hours though. Earlier in the day, the atmosphere was relaxed rather than raucous as people enjoyed the sun and warm temperatures. Celebrations in the resort kicked off with band Mojo on the Earnlsaw Park stage, and an aerial acrobatics show over the bay at 5pm and 6pm performed by Arrowtown circus school teacher Abigail Rose and three others. They were suspended from a crane about 25 metres in the air above the water outside the famous Eichardt's Private Hotel. The performance was based on fairytale Hoheria Blossom. One of the biggest New Year's Eve crowds in Wanaka in recent years converged on the lakefront. By the time midnight arrived, up to 5000 people had enjoyed bands and a warm, calm evening. Conditions were perfect for the pyrotechnics, launched from a barge in the lake, and they attracted applause from those watching from the Wanaka war memorial. With no sign of a change in the weather, it looked likely celebrations might continue well into the new year. A few tweaks were made to lakefront festivities this year in an attempt to restore some law and order in the town centre. A DJ stage hosted a range of well-known local DJs from 9pm to 1am, as part of a three-year trial to encourage and engage youth away from the main bars and Ardmore St. Meanwhile, things got a little bit country at Lake Hawea, thanks to the Top Paddock music festival being hosted at the Lake Hawea Hotel. Nine acts, including Australian band Hurricane Fall and New Zealand's Jody Direen, entertained about 2000 people on two stages from 4pm. The popular Rhythm & Alps, one of the largest shows in the South Island, was again held in the Cardrona Valley with a huge crowd on New Year's Eve. Now in its eighth year, the festival has become a household name - not just in Otago but around the country. This year's edition saw the likes of rappers Vince Staples and Action Bronson, UK DJs Bicep and Wilkinson, as well as Kiwi reggae band The Black Seeds. The festival began on Saturday and would run until the early hours of Tuesday morning. In Central Otago, drinks and dinner looked set to be the most popular choice, as crowds gathered at bars and restaurants in Clyde, Cromwell, Bannockburn, Alexandra and Naseby. There was live music and a DJ at eateries and bars in Clyde, and a piper would see the New Year in at the Ancient Briton, in Naseby. About 150 people attended the Papatowai Beach Carnival and Big Dig in the afternoon. Kids of all ages took part in a range of traditional fair games including three-legged races, sack races, a wheelbarrow race, and an egg-hurling competition. The activities concluded with the long-running Big Dig, organised by local crib-owners Wayne Allen and Peter Hill. Mr Allen said the number of people attending the event looked "on par" with previous years, despite the threat of showers. "In past years we've had people carry on digging for prizes for more than and hour-and-a-half, so I'm giving some of the little ones a helping hand with my 'magic stick'," he said. Carnival spokeswoman Emma Bardsley said people would return to their cribs once the digging had finished, before returning for an evening beachside bonfire and fireworks from 10pm tonight. "It's just a lovely, old-fashioned celebration," she said. Music lovers in Southland were in for a treat at the inaugural Bass Camp Festival being held at Camp Taringatura between Invercargill and Dipton. The event, which began yesterday and runs until January 2, would showcase musical performances, DJs as well as fire performers and daily workshops on everything from yoga to martial arts. 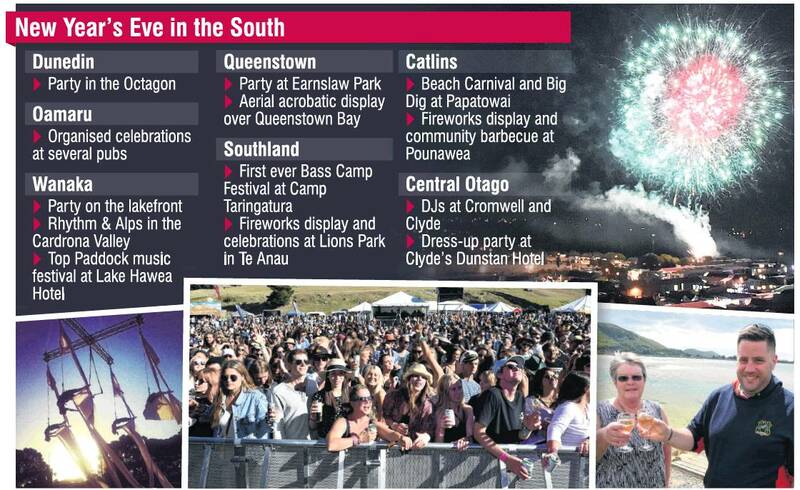 In Te Anau, up to 2000 people were expected to flock to Lions Park for the annual Party and Fireworks in the Park. Event co-ordinator Shayne Mercer said it was the biggest event the Rotary Club held all year.